Dear Our Lady Peace, I owe you an apology. I enjoyed your music through the 90’s, but after the turn of the millennium, I was unaware that you’d carried on as a band. 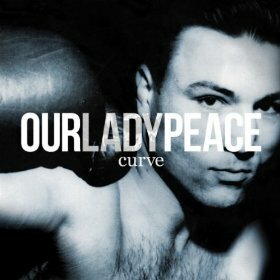 However, Curve has fallen into my lap, and I’ve since learned that two decades after starting out as a group, you’re still making relevant, entertaining rock. Please accept my kudos. After decades together, bands tend to fall into one of two categories: either they try to experiment too much and lose their core sound, or they fall into a rut while trying to replicate their past successes. Our Lady Peace have found a happy medium, returning to their guitar rock roots without rehashing the same old songs. As personal as the lyrics are, there’s always the opportunity to have a catchy singalong chorus turn a good song into an earworm, such as with “Fire in the Henhouse” and “Heavyweight.” Slinking guitars on “If This Is It” show that the band isn’t afraid to be unapologetically rock ‘n’ roll, while “Mettle” features audio excerpts from Canadian boxer George Chuvalo. Curve is refreshing for what it is as much as for what it isn’t. Each track is solid and holds its own on the album as a whole.